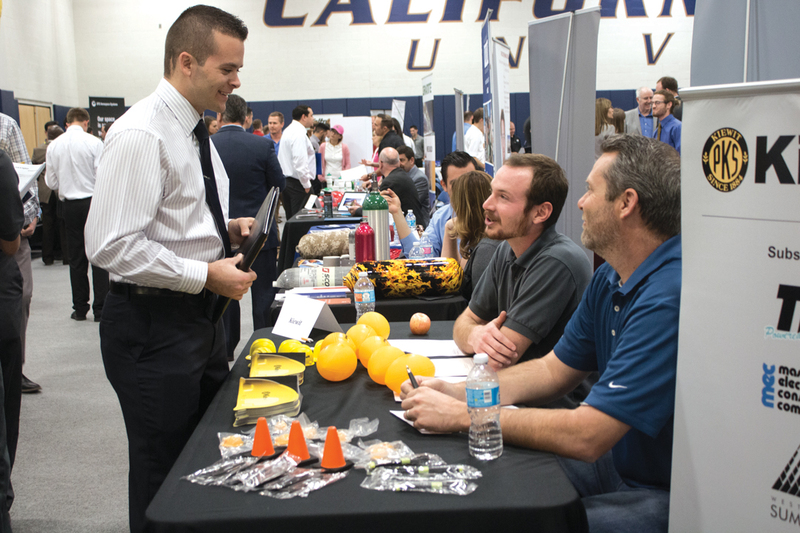 Students and alumni from California Baptist University filled the Recreation Center Feb. 24 for the Business, Engineering and Communication Studies Career Fair held by the Career Center. The fair boasted more than 110 employers from the Southern California area, offering part-time, full-time and internship positions. Mike Bishop, senior director of the Career Center, said he believes this is due, in part, to the excellent quality of students in attendance at CBU. “The school already has a lot of great visibility, but in the community, the more employers that are exposed to our students, the more attractive we become because the employers really do see we have a good quality of students,” Bishop said in a press release. Many of the companies that were present are well known, such as Sysco, Brenner-Fiedler, Wells Fargo, U.S. Bank and numerous police and sheriff departments. In addition, many of the companies present already employ CBU students on staff or as interns. Brenner-Fielder, a pneumatics and automation solutions provider, currently has CBU interns and was at the fair looking for other potential candidates. ESRI was also present at the fair, represented by alumnus Addison King. He started last year as an intern at ESRI after attending the career fair and is now a full-time accountant with the company after graduating in December 2015. Kyle Krukowski, senior business administration major, came to the fair looking for positions in finance. While Krukowski is currently looking for part-time work, he said he hopes it will become a career in the future. Daley Thomale, senior mathematics major, said she went to the Career Center for pointers before attending the Career Fair. The Career Center held preparation sessions in the days prior to the fair, as well as walk-in office hours for students to seek advice and resume review. During the walk-ins, the Career Center counselors assisted students with how to conduct themselves with potential employers. They also gave advice on what to say and how to dress to impress. The Career Fair also brought lesser-known companies such as International Sanctuary and Kahoots Feed and Pet Store for students to explore. International Sanctuary is a nonprofit that strives to empower and provide the resources for female victims of modern day slavery to gain an education and valuable skills to enter the workforce. The women are housed and hand-make jewelry they then sell. International Sanctuary has internship opportunities in Orange County and India, as well as full-time positions in jewelry design in the United States. Kahoots Feed and Pet Store is a growing holistic pet store with their own line of all-natural pet foods. The company has 24 store locations and continues to grow across California. The company currently has part-time and full-time sales and management positions available. The center will host a Teacher Career Fair March 10 from 3 to 5:30 p.m. in Innovators Auditorium. Employers from California School Districts and private schools will be in attendance, along with some after school and preschool programs. Full-time, substitute and tutoring opportunities will be available for students interested in going into a future of education, or who are currently pursuing education majors.